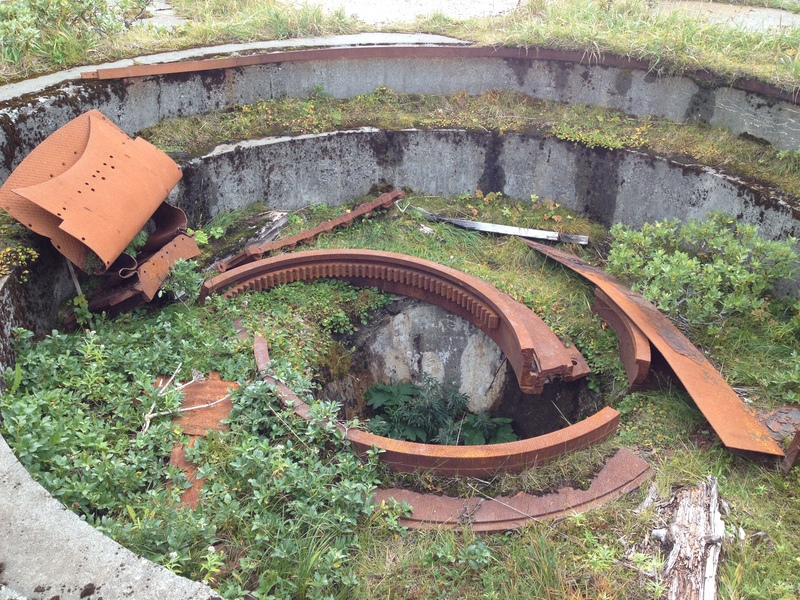 Remains of WW2 battery in Dutch Harbor. 23 d of September 2013 Dutch Harbor, Unalaska, Aleutian Islands, Alaska, USA. At the fishing boat harbor the fishermen are preparing their boats for the fishing season which starts in mid October. 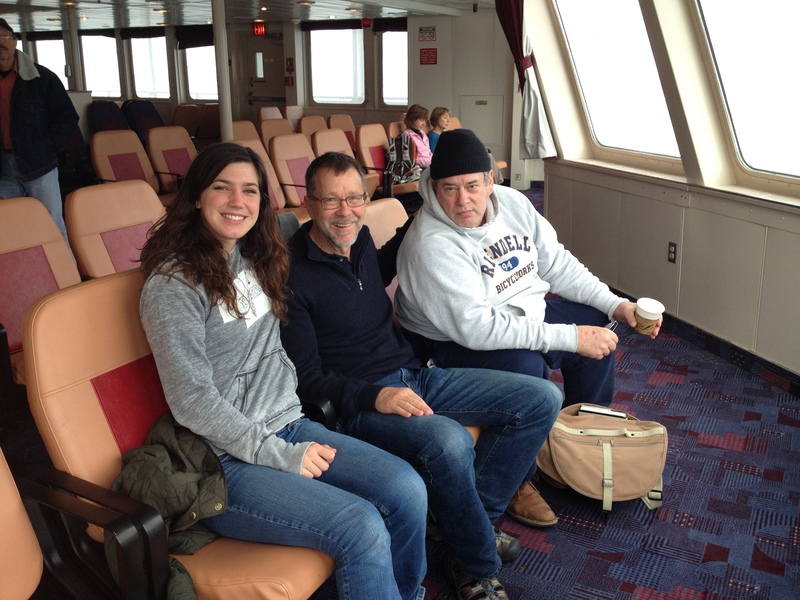 We were invited onboard Valiant, a cod and crab boat from Seattle. Captain Miguel from Mexico has his sons onboard as crew. David is a mechanic and showing us all the functions of the ship. It can take up to 120.000 pounds of cod which is put into cooled store rooms under deck. The crabs – Opilio, Red King Crab and Brown King Crab are kept in tanks with flowing seawater to stay fresh before they are cooked at the factories ashore in Dutch Harbor. At the bridge Miguel asks us if anyone plays guitar and runs for a acoustic guitar from his cabin. Everybody points at me and says – He does! So I play and sing the song Inez taught me: When I’m gone. Then it is Miguels turn to sing and play. Cumbia, Polka and La Bamba. Later, at the dock we meet Tim from the harbor who asks us to follow him to his house where he hands over one package of Sockeye Salmon and one with Halibut – his own catch. As a traveler you appreciate generosity even more because it makes you feel more accepted as a stranger. A couple of days ago it was blowing real hard and I barely managed to stand up in the gales. Big stones blew away from the slopes and ended up in the roads and the water in the harbor was whipped into steam. Though it was southerly warm wind which delivered smells of fall and soil to my nose. For the evening Yves, Alain, Julie and I had made an appointment in the bar of the hotel, but they never turned up. And as I guessed they were forced to move Libellule since there were 1 meter waves at the Spit Dock and she almost got crushed against the dock. Fenders and tie ropes broke. Steady wind at 50 knots and blasts up to 100 knots are not to play with. They can’t leave Dutch Harbor before Sunday 29 th and even after that it is not sure it will calm down. Close to the airstrip I found an old workshop from World War Two constructed as a basilica with a higher part with high sidelights and two lower parts connected at the sides. 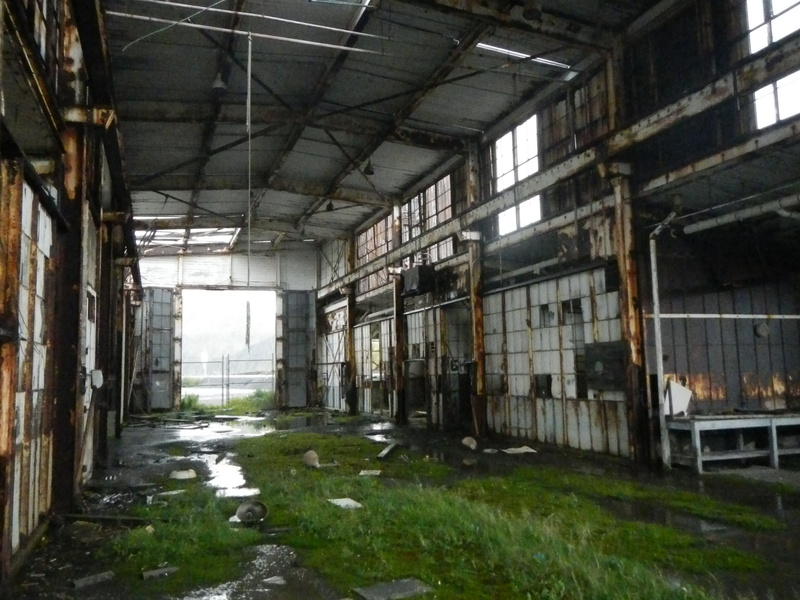 All bolted steel and rusty, roof broken, floor covered with green moss, puddles of water and littered with debris. A travers along the whole length of the room. Light is pouring through the broken roof and dirty windows. Water is dripping. 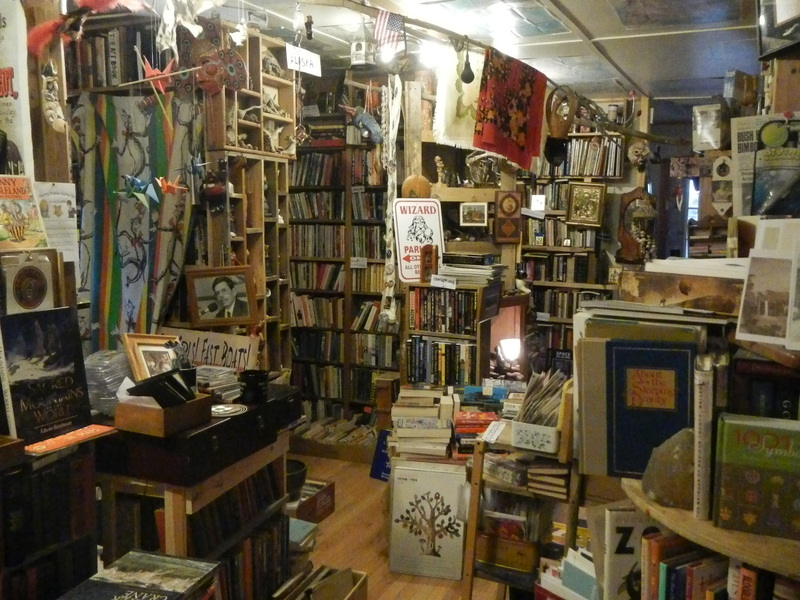 A beautiful space! 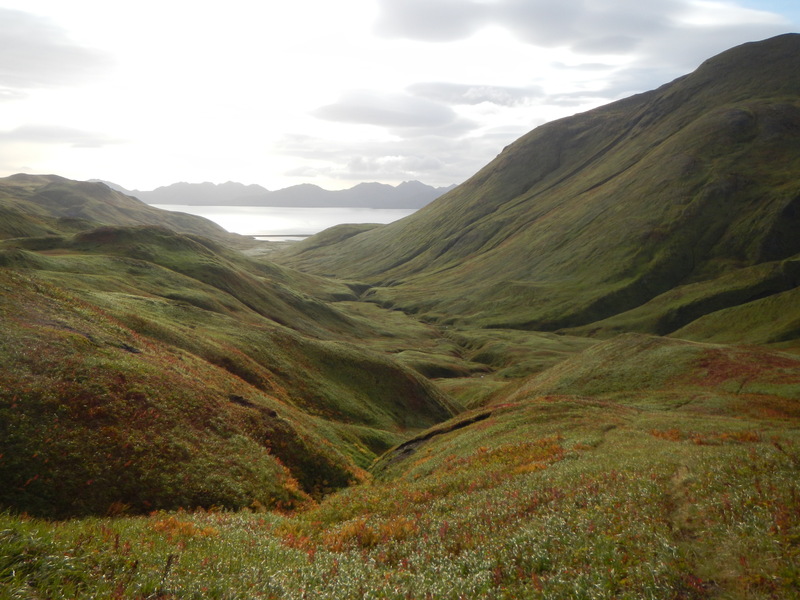 Together with the naturalist guide Suzi Golodoff I hiked the shore of Morris Cove and Peace of Mind Treck on Unalaska Island. She has been living here for 40 years and showed me a lot of different plants. There are lots of flowers here similar to Scandinavia like Willow, Angelica, Blueberries, Wild Strawberries, Crowberries etc. Colors are turning more red now and snow will come soon. The sun is a bit pale. The typical feeling of autumn is here. 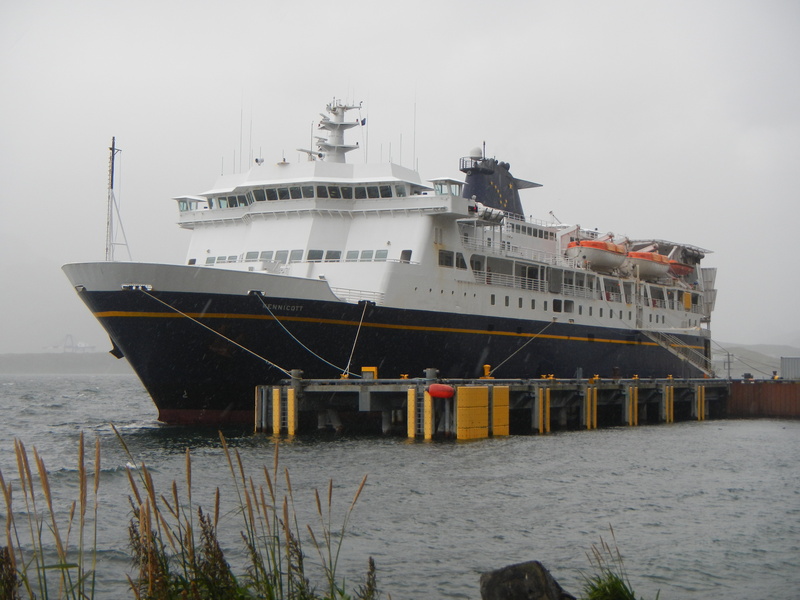 Tonight 23d of September I will embark the ferry Kennicot trafficing the Alaskan Marin Highway bound for Homer. 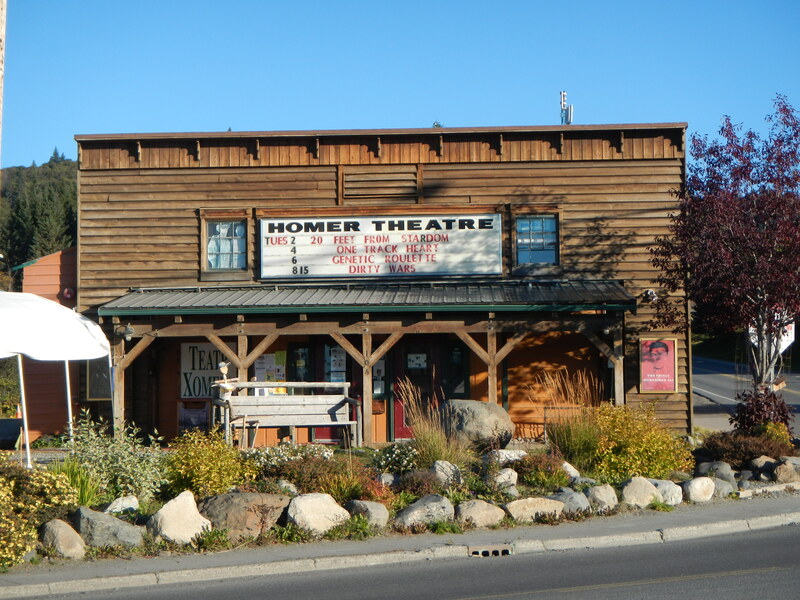 Expect to arrive at Homer 27th of September. Hopefully I will continue along the coast all the way to Vancouver. We will see. 24th of September – the ferry is delayed due to storm and will leave tomorrow 25th. I am installed on the ferry in a roomette, a tiny cabin 1,5 x 2,1 m with two berths and a small porthole facing the portside of sun deck. This entry was posted in Uncategorized on September 24, 2013 by richardnorthwest. 5th of September in the afternoon we set anchor at Herschel Island. The dingy was put in the water and off we went. Philipp is always eager to get into action and specially to get a hike onshore. On the shore Lee John, a Park Ranger from Canada Environment met us und told us that he just started heating up the sauna. But first we got a guided tour through the historic buildings on the island. 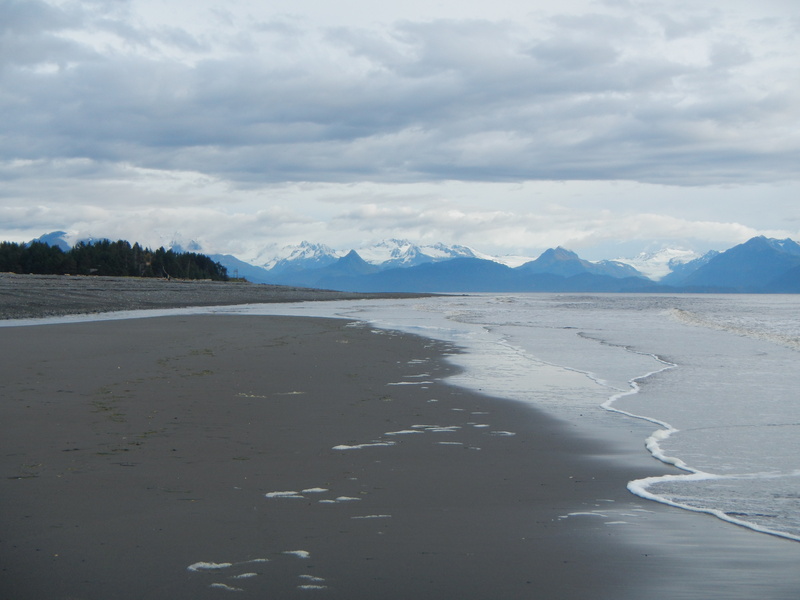 He also told us about the change in climate at the island – since the permafrost is thawing deeper and deeper there is a lot of erosion visible at the shores as well as higher up on the island. The island is like a huge Pingo and covered with green vegetation. There is a little museum with artifacts from the history of the island in one of the buildings which originally served as a lodgment for over wintering whaling captains. 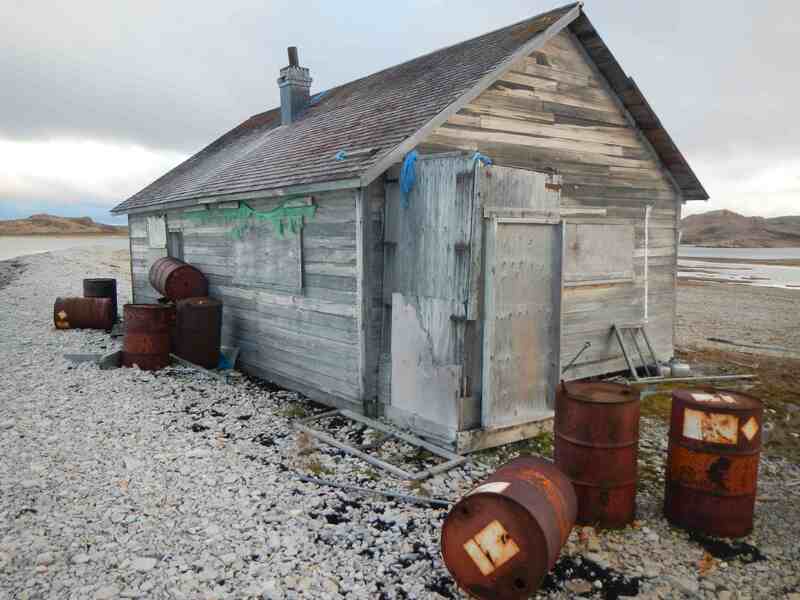 One house contains whale bones and things collected at the shores but it was built to store the baleens from the Greenland Whale that was used in women’s corset’s in Europe during the 19th century. Here they also stored the oil that was made out of whale blubber. 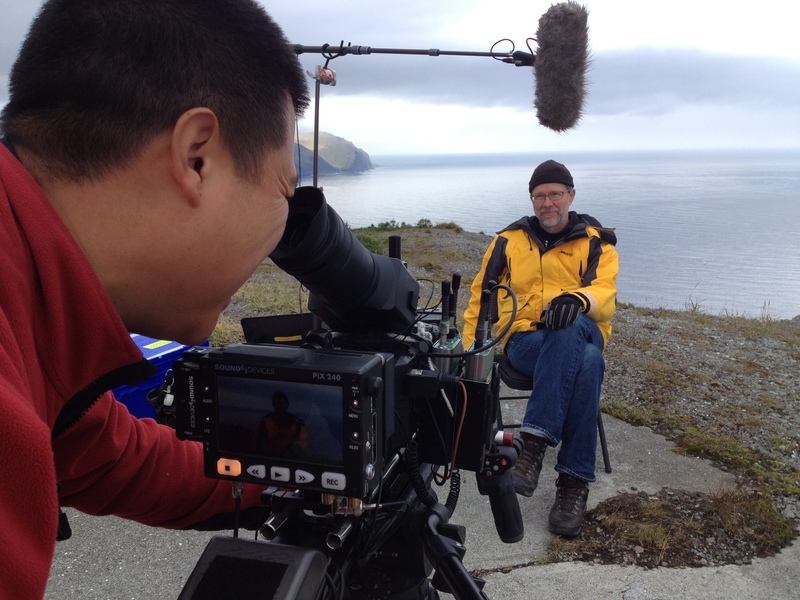 After the guide tour I got the opportunity to interview John Lee in front of the video camera. Behind me, mirrored in his sunglasses were two of his colleagues mounting a radio antenna on the roof of one of the buildings. Now the sauna was hot enough and we all enjoyed the heat from the huge rusty stove where driftwood logs were burning. 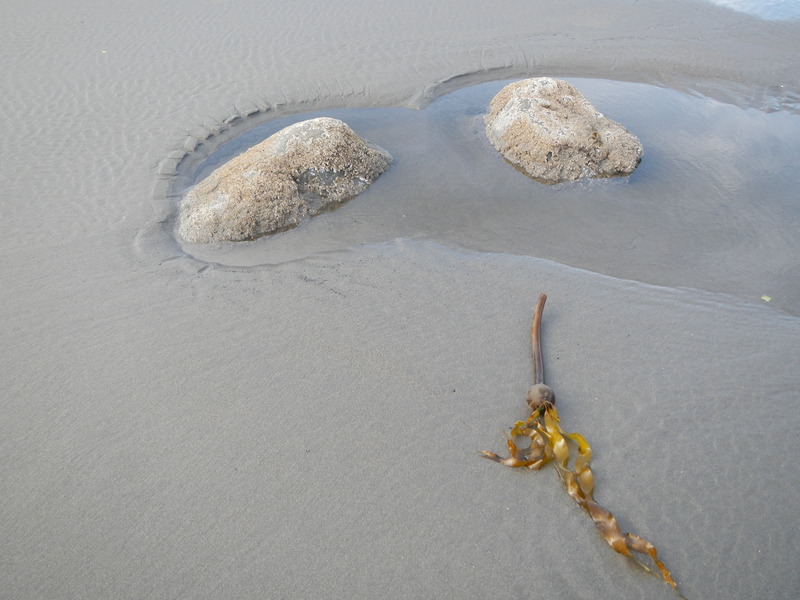 All houses are heated with driftwood since there is a lot washed ashore here. It comes from upstream the big MacKenzie River. After getting thoroughly heated up it was time for the cold plunge in the bay. The 4 degrees Celcius shock made us yell like children and our intimate parts grew diminutive. ”This is how cold it was”, Philipp said and measured up an inch between his thumb and index finger. We all felt refreshed and most alive and were laughing happily in the dingy on the way back to Libellule. After this short touchdown it was time to move on. We want to make it past Point Barrow as soon as possible. At this moment we have 40 nm left to Point Barrow and after this point our course will change to southwest. As far as we know now at least 5 boats have been forced to abort the North West Passage. Perd pas le Nord went aground on a sand bar and had to be evacuated by helicopter outside Point Barrow. 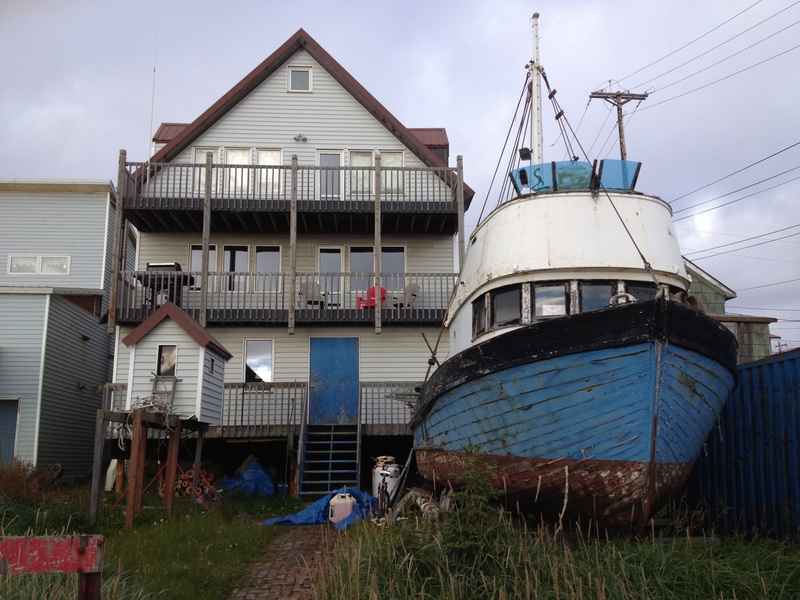 Traversay III had a leaking propeller shaft and plan to haul their boat up in Tuktoyaktuk. 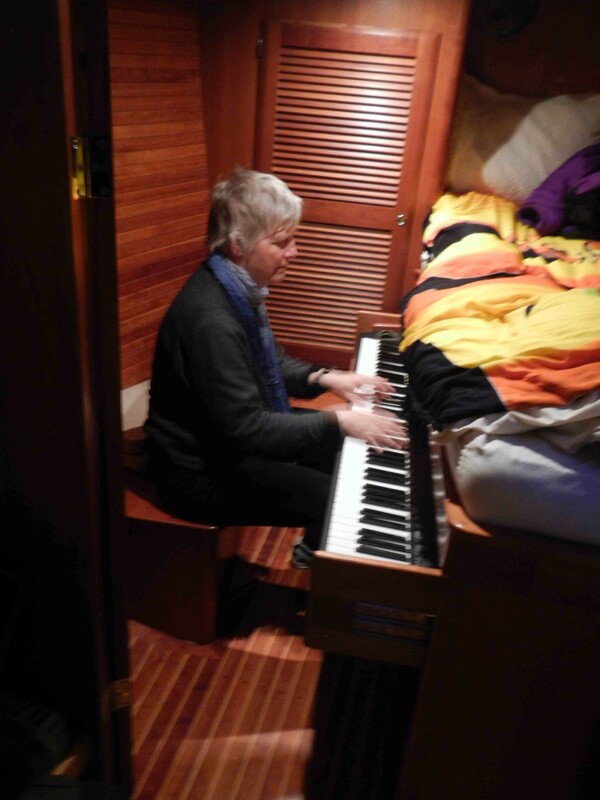 We met them in Pearce Point Harbour where Larry a retired pilot and his wife Mary Anne a musician, invited us onboard for a drink and Mary Anne entertained us on the piano she had installed in their steel vessel. Tooluka from Holland gave up due to the ice. Arctic Tern gave up and Dax gave up in Pond Inlet because of engine problems. All these have done the passage east west but there are more boats that are going west to east who got stuck in the ice. So far we are lucky but also well prepared due to strategic planning by our skilled skippers Yves and Sylvain. Life onboard Libellule. During the night we all take turns with the watch. We have three shifts at approximately three hours each starting at 2200. Depending on the circumstances the length varies. If there is rough weather we try to make the shifts short.You get waked up by the crew member who had the shift prior to yours by a gentle shake of your toes. You open your eyes and see a red light and a smiling face – ” Richard, time to wake up”. Usually I have a lot of underwear on already since it is just a few degrees in the cabin. I put on my two Woolpower sweaters, Javlin whole body fleece, my thick red fleece sweater and on top of that my yellow Musto trousers and jacket. I put on the blue cap pull up my hood and put on the lifejacket and hang the safety rope around my neck to have it ready for use on deck, grab my mittens and climb to the galley where I make a thermos of tea. After a mouthful of tea with honey I am ready to take over the helm. If anyone spots an Aurora Borealis he wakes the rest of the crew up to share the sight. Last night there was a white and cloudy northern light – like curtains of powder changing slowly. We yelled from excitement when we saw it towering over the mast. 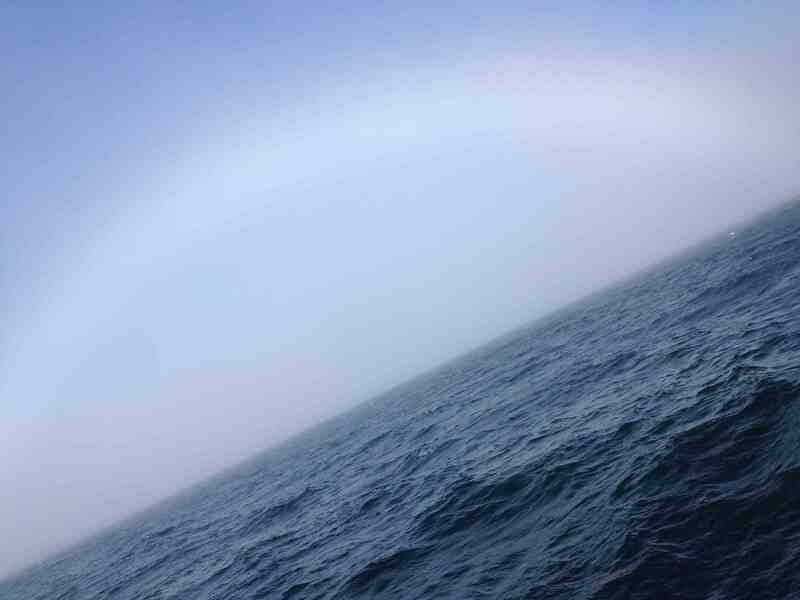 One night when I was at the helm and it was raining so the visibility was not that good, I saw a faint light like a little cloud in front of us. It was constantly growing and getting brighter and more orange. After a while it was very bright and almost blending and I could not make out what it was. Could it be an oil rig or a ship? I rose down to consult Philipp who looked at it and also couldn’t say for sure what it was. There was nothing on the radar or the AIS. Maybe it is a UFO? No! After a while it became obvious and to our surprise we now saw that was – the sun! It is amazing how fooled you can get. Since it was all dark and rainy you would not expect to see the sun like that. But anyhow it was really beautiful and impressive. According to the time you wake up everybody prepare their own breakfast. At around 1400 hours lunch is served and it always includes dessert or cheese afterwards. Cooking is high level and variation is great. After the meal Everyone besides the cook helps with the dishes – one do the dishing and the rest do the drying. The supper follows the same pattern but is often three courses. You are always surrounded by laughter which makes life onboard so much easier. Several languages are practiced on Libellule – French is dominating, second comes English and last german. My French is not good nor is my german so I mostly communicate in English. Good news – Traversay III managed to fix their engine problems. It was a loose engine foundation that needed to be welded. In Tuk a welder fixed it and now they are on their way to Nome. Rounding Point Barrow suddenly a lot of birds are visible around the boat and the air has a earthy tange with a touch of pine tree. At the Beaufort Sea no smell at all was detectable. This is a welcome sensation since passing the Beaufort Sea was quite boring, more like a transport stretch. 10th of September we are heading towards the Diomedes. Russia on starboard side and USA on our port side. Yesterday the sea was boiling in front of us with thousands and thousands of Thick Billed Murres. When they lifted in front of our bow there was an enormous thunder of feet running on the water and wings flapping against the surface. Theese birds are not happy to fly, but instead they are great divers. Tomorrow we will be in Nome where Philipp and Mickey will leave Libellule. 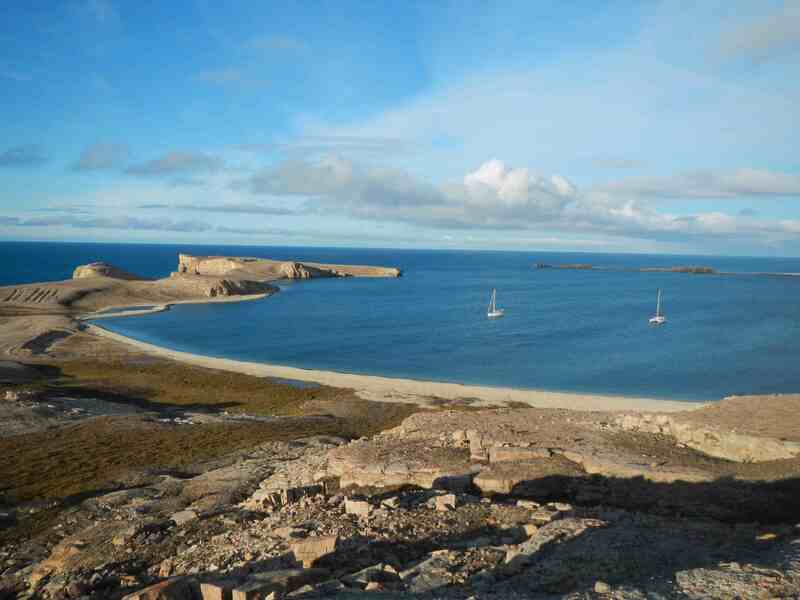 The 12th we will depart for Dutch Harbour and hopefully come there at 16th. Primitive Entertainment will meet us there to film the last part of my Northwest Passage. 11th of september we entered Nome Alaska. Yves opened a bottle of Champagne to lunch. Busy place – lots of golddiggers in the harbour. I saw trees for the first time in several months. Now I am the public library using their computer. This entry was posted in Uncategorized on September 17, 2013 by richardnorthwest. 2nd of September 1400 between Point Pearce and Cape Parry in Amundssen Gulf. In the rough sea the 47 feet catamaran Libellule is pounding heavily in the waves. Joints squeeching, engines idling. The wind is 17 knots northwest and it is snowing. Suddenly, after one month of malfunction due to the magnetic pole, the autopilot is showing the correct bearing. Very strange! It all happened in a second as the boat suddenly took another track. We have just had lunch consisting of spaghetti with pesto. Yves is at the chart table checking the instruments, adjusting the track, Sylvain is on deck smoking his home rolled cigarettes, Michael is in the sofa sitting resting with closed eyes and Philipp just came up from the cabin after a rest. There are four cabins on board, each with room for two persons and equipped with a head and a shower. 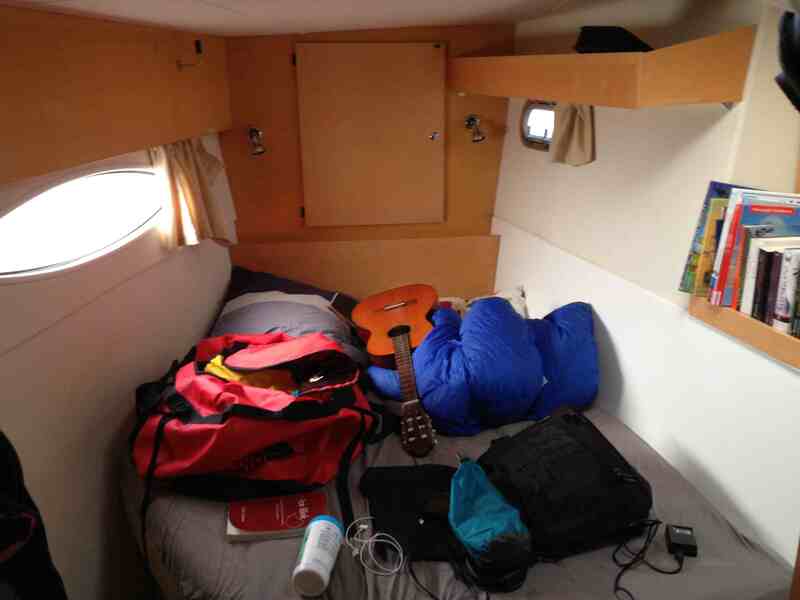 I have the portside bow cabin which is shaky and noisy in rough sea. Between the hulls there is a 20 m2 space with panorama windows containing social and dining area, chart table and galley. A sliding door leads out to the aft deck from which you reach the helm through a short ladder. The boat is very comfortable and well planned. The only thing that is not all pleasant is the low temperature on board. It it often only a couple of degrees Celcius when you wake up and a lot of condensation on the walls and windows. After a while you get used to the low temperature, it is just a matter of dressing. To deal with the condensation there is a constant drying with “le chamis” a highly absorbent cloth. 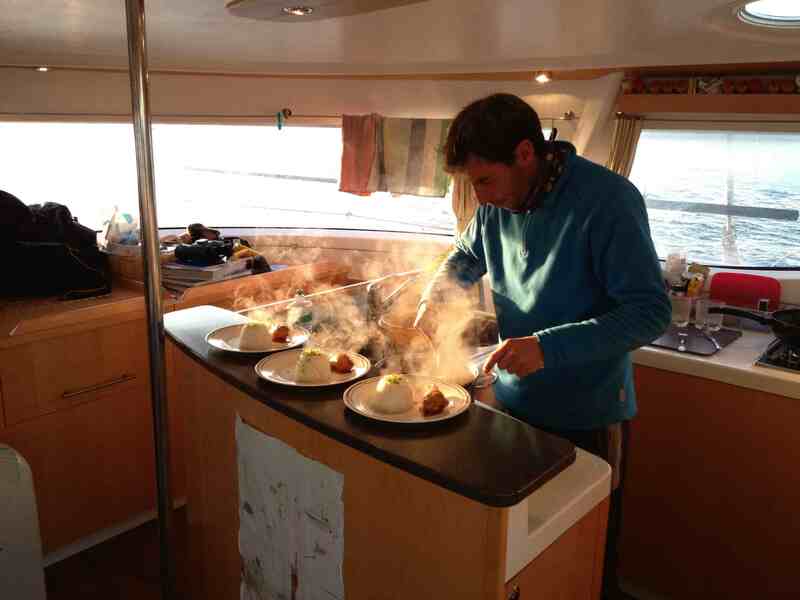 The low temperature is far compensated by the warm social atmosphere on board. Easy going and no harsh words are spoken. The two french skippers Yves and Sylvain are really solid blokes – always laughing and calm in all situations. The last night in Pearce Point Harbour we had to reanchor five times in 45 knots of screaming wind and snow whipping your face. There was also a problem with the anchor winch. Yves at the helm and Sylvain at the anchor box signaling to each other with gestures and hollers for efficient communication – nice and easy! The Swiss owner Philipp is also a very pleasant person, looks a bit like George Clooney. Calm and steady in all situations despite the threat we might not make it through the ice and get stuck somewhere along the Alaskan coast. After Herschel Island there is very little protection but as soon we have past Cape Barrow it is more safe – at least considering the ice threat. There is also an uncle of Philipps named Michael. He is the oldest one of us and have lots of funny stories to tell. A friendly man with curious eyes who, like me entered Libellule in Cambridge Bay! Likes to cook so we have done some cooking together. Not to forget the general level of cuisine – every lunch or supper is at least a two coarse meal. Everything tastes so good. It is like paradise for me. 1530 – Cape Parry is now visible on the port side in the distance. A newly downloaded ice chart shows ice concentrations of mostly 2/10 but also 8/10 north of Cape Bathurst. Wind is northwest and thus pressing the ice towards us and the coastline. 3d of September. Passed through an ice belt outside Baillie Island. The passage took 6 hours and we were helped by a polar bear. For a while penetrating the ice looked impossible and we were about to give up. 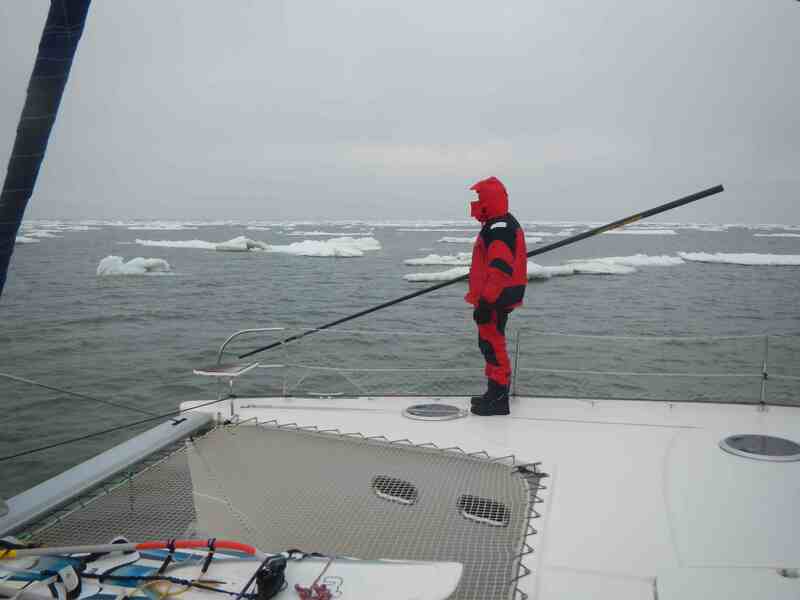 Then Yves saw the polar bear on the ice floe, we went closer and – what a luck we found a passage through the pack ice. The bear looked fat and healthy and was watching us curiously for a while before it run away. Got some nice footage of it. Later, after passing the ice all felt relieved, specially Philipp who was worried we would not make it. Soon we had some wonderful sailing with easterly wind and made over 15 knots on the waves. 4th of september 0130 we entered Tuktoyaktuk and moored at the small dock and, after discussing the schedule for the day, we went to bed. Breakfast and refueling at the gas station close to the dock. Mickey and I were helped by Baily, a 10 year old boy who eagerly opened and closed our jerry cans. We fueled exactly 500 liters of diesel. We had a really fatty lunch with chicken wings and onion rings with dip at the local store. This afternoon we will continue towards Nome, Alaska and no stopping on the way. So, until then enjoy your life and stay safe – I do! This entry was posted in Uncategorized on September 4, 2013 by richardnorthwest. Canada Cambridge Bay – Westward Ho! Joined the Libelllule katamaran today 28th of August. Philipp owner and crew Yves, Silvain, Michael and me. Got my own cabin – how about that! We just done some shopping for the boat and I bought myself a pair of well insulated rubber boots. According to a local man I asked, he uses the same sort I got all year around. I also found some mittens since gloves don’t function so well when it is freezing and you are on the watch. Today everybody seems to be gathered in Cambridge Bay. There are several sailing boats doing the passage. Some Alaskans coming from Seward decided to put their Empiricus on the hard over the winter and start the next season by exploring the vicinity and not just rush through like most Northwestpassengers do. They invited me to Seward if I come there. There are also two guys in a rowing boat coming down the McKenzie River and through Tuktuyaktok to here. Besides that a cruise ship is anchored in the bay so now the whole village is boiling with waterbound tourists. At this moment I am so happy the way my journey has developed. I might consider myself as THE HITCHIKER OF THE ARCTIC. Lots of credits to my personal hitchhiker travel agency Primitive Entertainment. A truly primitive and basic way of travelling 😉 I have no idea when I have possibilities to connect to internet next time. Maybe in Tuk. The ice situation at this moment at Amundsen Bay where we are heading is not good but things change really quickly. Depending on the wind and currents it is impossible to get any forecast, you just have to stay updated with the ice charts. 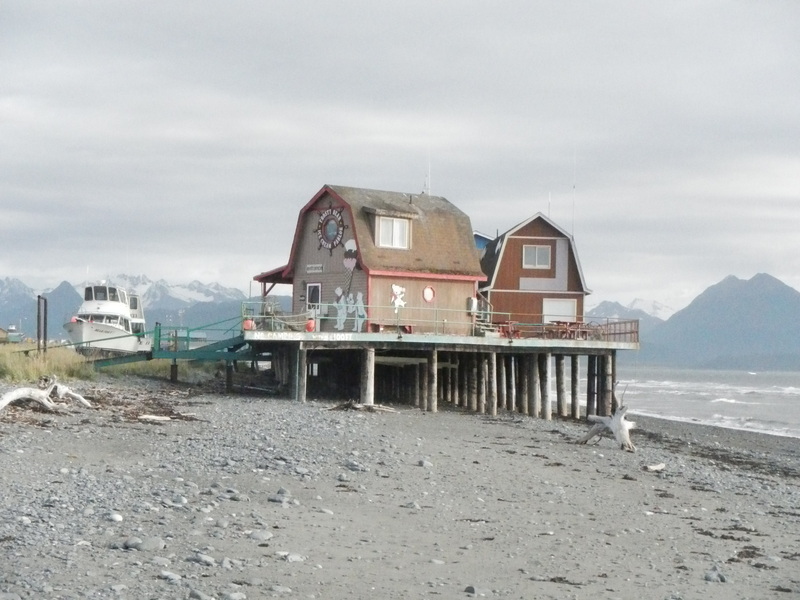 We don’t want to get stuck somewhere along the Alaskan coast surrounded by sea ice. But as soon we have passed Barrow, Alaska we don’t have to worry about ice. The rough sea is not a big problem to Libellule according to Philipp, the owner. 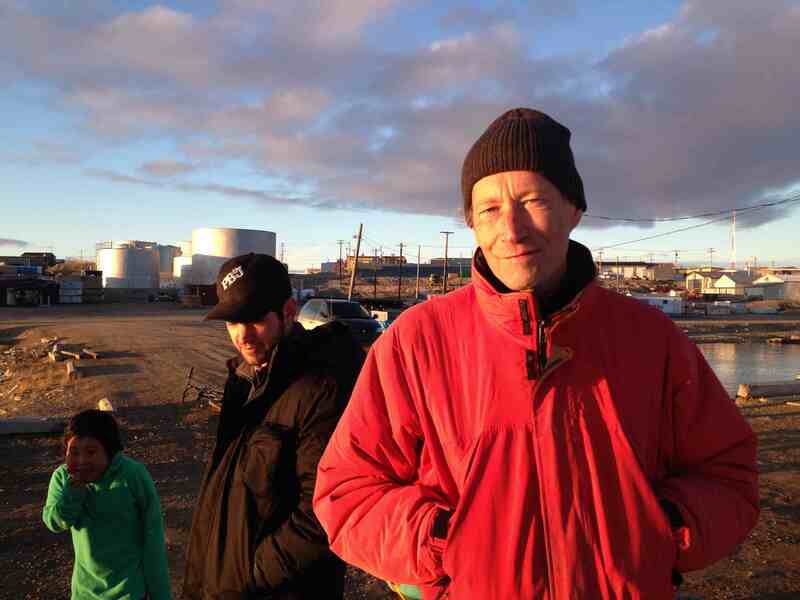 This entry was posted in Uncategorized and tagged Amundsen Bay, Cambridge Bay, hitchhiker of the arctic, Primitive Entertainment, Richard on August 28, 2013 by richardnorthwest.